With the Bharatiya Janata Party's ties with some of its allies under strain, party chief Amit Shah on Monday spoke of giving "respect" to the existing partners and expanding the Centre's ruling National Democratic Alliance by bringing in "new friends" ahead of the Lok Sabha polls next year. In Tamil Nadu, where the party is looking for allies to broaden its support base after winning one seat in the last Lok Sabha elections, Shah invoked Tamil pride, insisting no other party was as committed to preserving it as the BJP. "We will give respect to our existing allies and bring in new friends before the Lok Sabha elections and give the nation a clean government," he told a meeting of around 15,000 members of the Shakti and Maha Shakti Kendras of the BJP on the outskirts of Chennai. While a Shakti Kendra in-charge is vested with the responsibility of overseeing the party work of five booth level functionaries, a Maha Shakti Kendra office-bearer is the overseer for five Shakti Kendra functionaries. 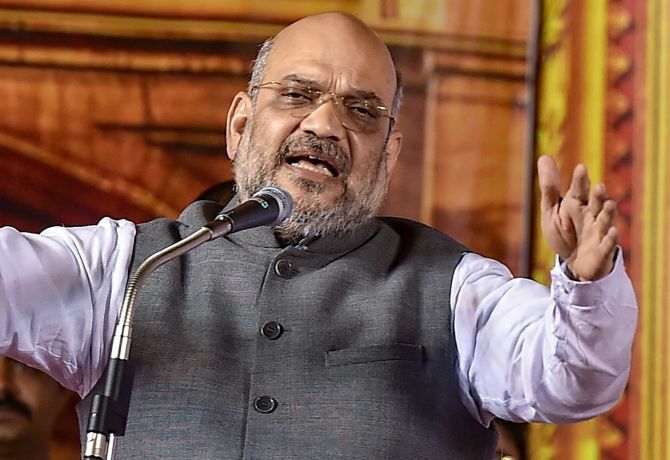 Shah, under whose stewardship the BJP has scripted victories in many state assembly elections after the party came to power at the Centre in 2014, said he would announce its new partners in Tamil Nadu before the Lok Sabha elections. The BJP had tried to rope in superstar Rajinikanth without any success. The state's ruling All India Anna Dravida Munnetra Kazhagam, which has lost much of its sheen following the death of its charismatic leader J Jayalalithaa, is being seen as attempting to cosy up to the BJP. The BJP's relations with some alliance partners, including its oldest ally the Shiv Sena, Nitish Kumar's Janata Dal-United, Akali Dal and Rashtriya Lok Samta Party of Union minister Upendra Kushwaha, have been somewhat tense, and Shah's comments are being seen as an attempt to smooth their ruffled feathers. Without naming the main opposition in Tamil Nadu -- the Dravida Munnetra Kazhagam -- Shah said it had started a "disinformation campaign" on the issue of "Tamil pride". "Those who are raising the issue of Tamil pride are engaging in disinformation against us. No party is as committed to preserving Tamil pride and Tamil language as the BJP and its Tamil Nadu unit. "When they were in power at the Centre as part of the UPA, railway tickets were not printed in Tamil language. It has happened when Narendra Modi is in power. The BJP respects the pride of all states at it is embedded in our cultural upbringing," he said. The DMK has often accused the Centre of neglecting Tamil language and culture. Shah said from the day a government, which has the BJP as its constituent, takes office in Tamil Nadu, it will start making efforts for teaching Tamil language beyond the state to those who are interested in learning it. The BJP chief, who met party leaders and workers during the day to galvanise the party apparatus before the Lok Sabha polls, said a conference of 1.25 lakh booth-level functionaries will be held in October which will be attended by Prime Minister Narendra Modi. He asked party activits to fan out to each part of the state to ensure people reaped the benefits of over 120 schemes launched by the Modi government for women, poor, Dalits and other deprived sections of society. Noting that the development of Tamil Nadu was one of the priority areas of the Modi government, Shah said it allotted projects worth over Rs 5 lakh crore to the state in the last four years. "When they (the DMK) were in power at the Centre, the 13th Finance Commission gave the state Rs 94,540 crore. When the Modi government came into being, the 14th Finance Commission earmarked Rs 1,99,096 crore for Tamil Nadu. "What the Modi government did for the state in the last four years, no dispensation could do in 70 years," he said, listing out various centrally-sponsored projects and funds allocated for them. The BJP president alleged corruption scandals involving a stupendous Rs 12 lakh crore occurred during the 10 years of UPA rule. He said wherever the BJP formed its government or was part of the ruling dispensation, it ensured corruption was rooted out. "Corruption has been eradicated in Gujarat, Rajasthan, Chhattisgarh, Maharashtra, Haryana, Assam, Nagaland, Uttar Pradesh, Uttarakhand....it has been rooted out in 19 states where we are in power. He exuded confidence that the BJP would emerge as a force to reckon with in the state in the next Lok Sabha polls. Modi it is for BJP in 2019 but will state allies play along?